Mmm…garlic. Garlic is a super common cooking ingredient in many (of my) recipes because of its distinct and delicious flavor. It can be cooked, fried, baked, raw, roasted, boiled, and more and it has a different flavor based on how it is prepared and cut. That being said, many people just don’t like cooking with garlic or don’t know how to cook with it properly. Even in our house, Dustin hates to cut garlic. Like — he hates to cut it so much, he’ll avoid recipes that call for it or come and ask me to mince some garlic for him. The good news is that there are some very simple tricks for how to cook garlic, which I’ve listed below. You’re actually not supposed to cook the garlic PRIOR to adding any of the other ingredients. Actually, the garlic should be added almost last. Minced garlic, for example, only needs a minute or two to completely cook and become fragrant. So, if sautéing onions and garlic together, for example, cook the onions all the way until they are tender and then add the garlic. Once you can smell the garlic cooking, it’s ready. Never add garlic to a very hot pan – this is just asking for the garlic to burn. And burned garlic is a no-no. There’s no way to fix it and it’s gonna be bitter. Garlic will have a different flavor based on how it is cut. The garlic that is exposed to air when it is cut undergoes a chemical reaction that produces the strong aroma and potent flavor. So a whole garlic clove, for example, will give off very little garlic flavor compared to minced garlic. Think about it in terms of size, starting with garlic bulb all the way down to pureed garlic: the smaller the garlic, the bigger the flavor. If you hate mincing garlic, invest in a garlic press. These tools are great for people who love garlic, but hate to chop it up. A garlic press will get you perfectly minced garlic without the mess and you might not even have to peel it. Don’t buy jarred garlic. Like ever. The flavor just isn’t nearly as good as fresh garlic. It takes less than a minute to mince garlic or even less time using a garlic press, and the taste of your food will be sooooooo much better if you use fresh garlic. I’d even use powdered or granulated garlic over jarred “fresh” garlic. Don’t over-do the garlic. Some people think that, if you can taste the garlic in a dish, there’s too much garlic. Personally, I disagree with this thought…but I do love garlic a lot. 😉 You definitely don’t want garlic to overpower your food, however. What Is The Flavor Of Garlic? 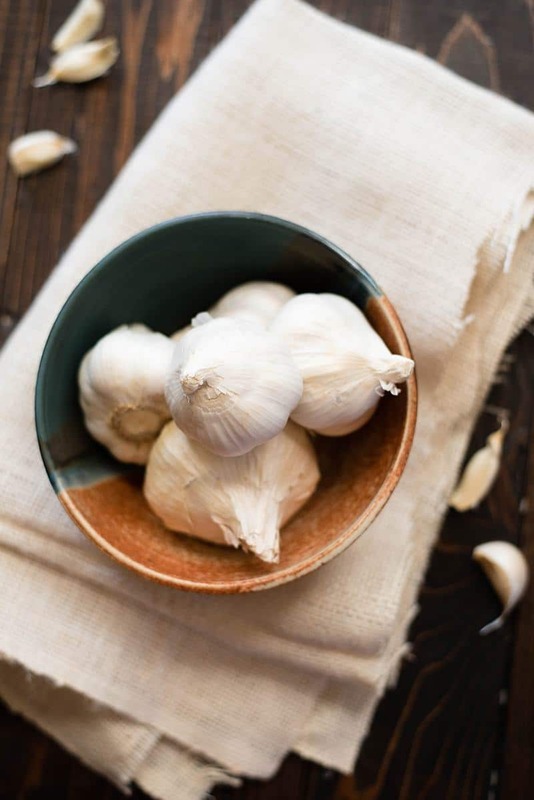 Raw garlic has a very pungent, strong, and almost spicy taste. When cooked, the spiciness mellows dramatically and the flavor becomes sweeter. Roasting garlic releases the most amount of sugars within the garlic and the result is a delicious, nutty flavor. When making fresh, vibrant flavors, like salsas or bruschetta, you’ll want to use raw, minced garlic to evoke the strong, pungent flavors. If making soups or stews, chopped garlic or smashed garlic is often a great way to add flavor, especially if you will also be pureeing all the soup together. 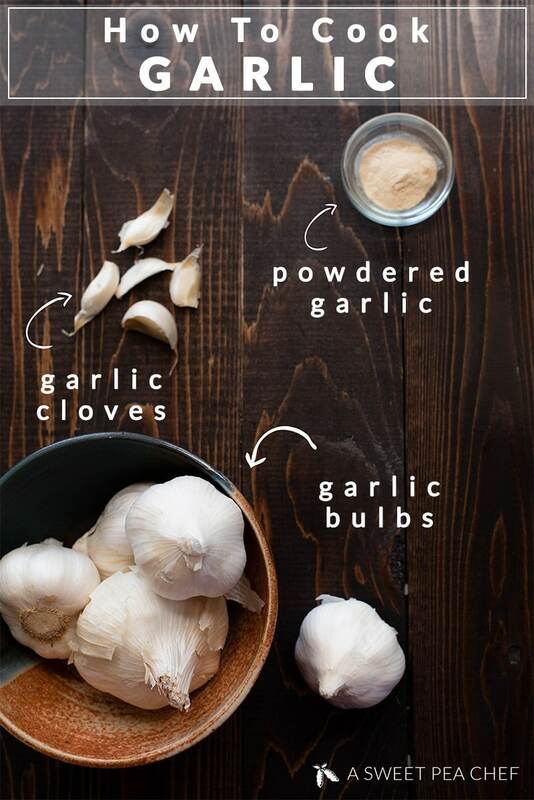 When cooking with vegetables or seasoning sauces that won’t be pureed, minced garlic is a great way to add the depth of flavor of garlic without overpowering the dish. If roasting garlic, keep in full cloves to avoid burning and because the cloves will have a mellow, sweet flavor when roasted and you’ll be able to get away with eating them whole. I also like to use powdered garlic in spice rubs, spice blends, and seasoning salts, especially if I will be grilling to avoid burning fresh garlic and to add flavor to the food. Burning garlic actually causes it to turn bitter. Ewww. While roasting and baking garlic can bring about a sweet, deep, almost nutty flavor, burning the garlic will not be tasty at all. There’s no way to fix it either, other than starting over. If you’re new to cooking with garlic, it can be quite frustrating to deal with the stinky, papery garlic cloves. Watch this video to see how to peel and mince garlic. Want more recipes that use garlic? Click here. Leave a comment below if you’d like to learn more about how to cook garlic and I’d be happy to answer. Or, if you’re interested in learning more about a garlic press, click here.